There's no way around it, we love to travel. The world is a wonderful place and there is so much to see. We try to get in 3 or 4 major trips a year, which is a challenge while Marj is still working. Once she's retired like me, we should be able to manage the travel a lot easier. Earlier in our lives we did land trips - either by driving or flying to a location and then sightseeing the area. Recently, we've discovered cruising and find it to be an excellent way to see the world. You just unpack once, and then every day you wake up to a new location. The drawback is that you tend to have only a few hours to spend in each port. However, if you're willing to live with that, then it's a luxurious way to travel. I have written up a diary of each trip we've taken since 2001. You can review any of our trips from the links on the left sidebar. 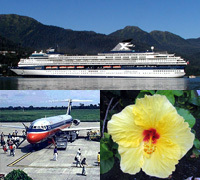 I have also included links to some very helpful Web sites to help you plan your cruises and land trips. Judging by the number of shelves dedicated to travel books at Borders, Chapters or Indigo, travel is second only to cooking as far as books are concerned. After reviewing many different travel books, I've found that no book can cover everything, and that each "brand" focuses on different aspects of travelling. For example, Fodors and Frommers have good coverage of restaurants, places to stay and activities. Lonely Planet is the "green" slant on travelling. However, for my own taste I really like the DK Eyewitness series of travel guides. They tend to concentrate on history and sightseeing, with the best selection of colour photos and diagrams of any book I have seen. The most exciting travel "tool" on the Web is Google Earth. 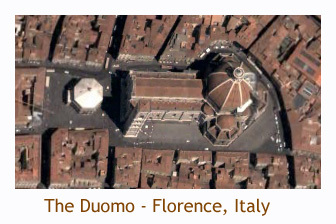 It uses satellite imagery to provide a complete map of the globe. You can zoom from a picture of the globe right down to a specific building. In some cases you can actually see cars and people! Due to data limitations, the maximum resolution varies around the globe, with only important cities receiving the full resolution. Other less densly populated areas have a much lower resolution. However, if you're traveling to major cities, you'll be able to locate and identify all of the notable parks, palaces, fountains, etc., plus the routes between them. Great fun! I would really recommend that you install and use this application. Once you get used to Google Earth, you can permanently mark all of your favorite locations making them easy to find again. You can also store photos and/or overlay them on the satellite images. Cool stuff! One thing to note - the satellite imagery is not real-time, it is approximately 3 years old. For example, when I GE'ed our house in Calgary, the nearby Real Canadian Superstore is shown as under construction, which was about 3 years ago. The following links will take you to Web sites that allow you to research or book your travel itinerary. There are literally hundreds of such Web sites, but these are the ones that we have found to be the most useful. TripAdvisor - This is probably the best info/forum site for questions on anything travel related for any part of the world. It is great for posting questions and receiving answers from travellers who have actually been there. Travelocity - This is a great tool for booking flights, cruises, hotels and rental cars. Sometimes they offer better deals than contacting the supplier directly. The Earth is a large place and there is so much to see. I decided it would be nice to keep track of where I've been, so that I can have a sense of how much I've seen, and how much still awaits my person. I've made up a list of all of the countries of the world, and also broken Canada and the US into provinces and states. Check my Country Chart to see my progress to date. I am also interested in tiny countries, so check my Small Countries Progress Chart for details. Mar '06 - Florida, Bahamas, Tortola, St. Maarten, St. Kitts, St. Lucia, Barbados, St. Vincent, Trinidad, Bonaire and Curacao. Oct/Nov '06 - Germany (Frankfurt), Turkey (Istanbul, Kusadasi), Greece (Mykonos, Santorini), Croatia (Dubrovnik), Italy (Venice, Florence, Rome, Naples), France (Nice), Monaco, Spain (Barcelona, Malaga), Portugal (Lisbon, Funchal). Dec '06 - Ecuador (Quito, Guayaquil, Galapagos). May '07 - China (Beijing, Qingdao, Jin'an, Tai'an, Qufu, Xi'an, Guilin, Yangshuo, Hangzhou, Tunxi, Huang Shan, Nanjing, Shanghai). Jun '07 - Alaska (Ketchikan, Juneau, Skagway, Whittier, Anchorage, Talkeetna, Denali, Fairbanks). Aug '07 - England (London, Dover), Estonia (Tallinn), Russia (St Petersburg), Finland (Helsinki, Porvoo), Sweden (Stockholm, Helsingborg), Latvia (Riga), Germany (Lubeck, Wismar), Denmark (Copenhagen, Helsingfor). North America - All '09 / '10 - Hey, I live here! On our travels we have been fortunate to visit the gravesites and/or residences of many famous people. Some we purposely seeked out, while others we came upon by chance. I have a Famous People page with photos of the places we have visited.